If you type the word “cocktails” in the search box up to the right there, you’ll find about a dozen posts and recipes, mostly by Lisa, though my family makes good use of cocktail hour ourselves. This time of year, while most folks are stirring up jugs of eggnog, Lisa and I are happily mixing pitchers of milk punch, spiked for us and plain for the kids. But much as I love it, milk punch is kind of a dessert (even when, as I often do — though Lisa might think this is heresy — I leave out the cream and even make it with low-fat milk); I can’t drink it before dinner (that is, during cocktail hour). And while I am happy to have a post-kids’ bedtime drink, some days, of course, call for a cocktail before dinner and one after. Enter the Maple Leaf, which Tony mixed up for me for the first time last week. It is both appropriately wintry and works with the primary ingredient we enjoy here at my parents’ home in Connecticut. 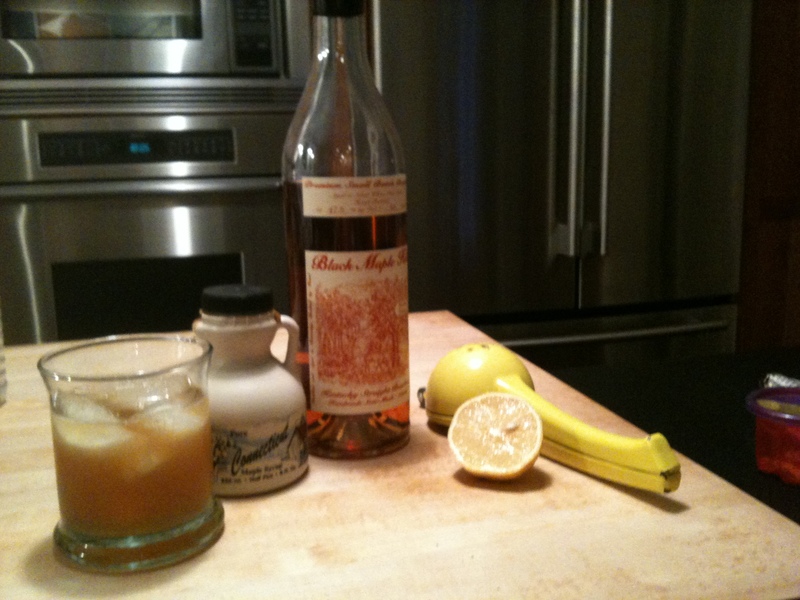 So don’t pour all that maple syrup on your pancakes and waffles this week; save some for cocktail hour! Shake well with ice and serve on the rocks. Caroline! I agree with everything here–except then skinny version of milk punch! But I like it best as desert too…and we will have to try this one soon! Maybe add a little crushed sage leaf?